Canine PRO6 is the only probiotic specifically designed just for dogs. All other canine probiotics either have few, too many or the wrong probiotic strains. 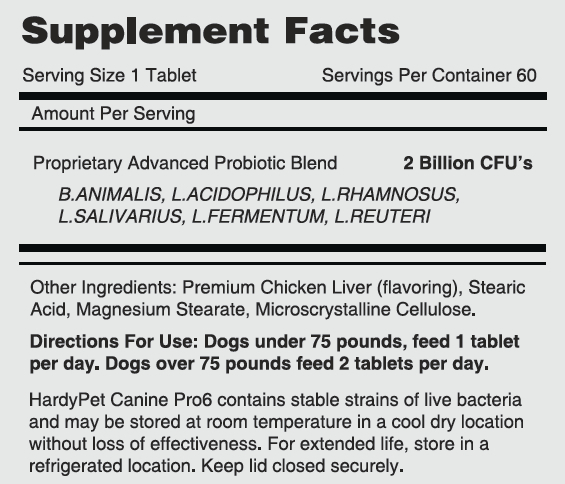 It is critical to provide your dog with the probiotics proven to benefit their unique digestive system. The digestive system of dogs, and humans, contains "friendly bacteria", also known as Flora, which perform a critical role in canine health. Like in humans, a lack of the correct probiotic strains causes a number of debilitating conditions which can be difficult to treat and even diagnose. 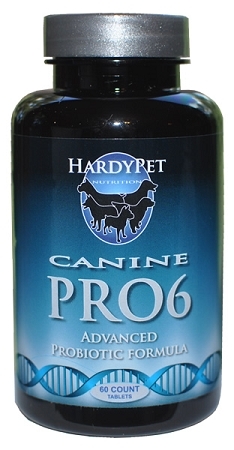 Canine PRO6 is a combination of the six probiotic strains which have been proven to specifically benefit your dog. Probiotics start by lowering the pH of the intestines and boosts the number of beneficial flora and at the same time reduces the number of harmful bacteria which cause infections and other conditions. This change of atmosphere in your dog's intestinal tract is critical to good overall health and prevents disease-causing pathogens to take hold in the small intestine. Another important function of probiotics is to improve the health of cells in the gastrointestinal tract which produce digestive enzymes. The increase in enzymes improves overall digestion, reduces excess gas, and restores balance to the colon which can eliminate diarrhea caused by a typical system imbalance. Many veterinarians recommend using Canine PRO6 when antibiotics are required to manage antibiotic-related diarrhea and for their patients who undergo cancer treatments which suppress normal immune function. Unfortunately, there are very few canine probiotic products which contain the correct kind of flora and there is no other canine probiotic brand which has the right mix and dosage of canine-appropriate flora. Giving your dog probiotics meant for humans can cause great damage to the digestive and immune system which can have lasting effects. Canine PRO6 is the result of over 10 years of industry research and 5 years of our independent field trials to ensure the perfect results for your dog. How do I know if my dog needs a probiotic? * Anytime antibiotics are used to treat your dog. Is there scientific research showing Canine PRO6 is beneficial for my dog? Evaluation of efficacy of probiotics in prevention of candida colonization in a PICU-a randomized controlled trial. Highly regarded study which determined the importance of supplementing with probiotics to combat candida overgrowth. -- Kumar S, Bansal A, Chakrabarti A, Singhi S. Source Department of Pediatrics, Advanced Pediatric Centre, Chandigarh, India. Early exposure to probiotics in a canine model of atopic dermatitis has long-term clinical and immunological effects - One of the more important studies linking early probiotic treatment in puppies to the improved immune system health and reduced frequency of skin issues in adult dogs. Which Flora are in Canine PRO6? B. animalis - a naturally occurring strain of canine flora which is often in short supply. Known to play an important role in colon health. L. acidophilus - A robust strain which passed through the harsh environment of the stomach and into the small intestine. Studies have shown this strain is key in restoring balance to the digestive system, increasing the ability to absorb nutrients, and reduce allergy related skin issues. L. rhamnosus - A native canine strain responsible for combating active yeast and intestinal infections. Supplementing this strain is critical for digestive health in dogs. L salivarius - Mainly responsible for maintaining proper pH balance within the stomach which inhibits the growth of harmful bacteria and pathogens. L. fermentum - This strain is helpful in combating the growth of harmful bacteria and pathogens in the small intestine and colon. L. reuteri - Instead of inhibiting the growth of harmful bacteria, this strain actively fights harmful bacteria by producing compounds which act like antibiotics. This "search-and-destroy" flora is particulary help in recovering from a course of antibiotics. Is Canine PRO6 guaranteed to help my dog? All HardyPet products offer a 30 day money back guarantee to ensure you are completely satisfied with your purchase. There are no hidden requirements or hoops to jump through. Simply return the unused portion within 30 days of your purchase and we will refund you the purchase price. No questions asked. All HardyPet ingredients are sourced and assembled in the United States of America. No ingredients from other countries are ever used in our products. The products and statements made about specific products on this web site have not been evaluated by the United States Food and Drug Administration (FDA) and are not intended to diagnose, treat, cure or prevent disease. All information provided on this web site or any information contained on or in any product label or packaging is for informational purposes only and is not intended as a substitute for advice from your veterinarian or other canine health care professional. You should not use the information on this web site for diagnosis or treatment of any health problem. Always consult with a canine healthcare professional before starting any new vitamins, supplements, diet, or exercise program, before taking any medication, or if your dog has or you suspect might have a health problem.